Jordan Romero becomes the youngest person in the world to scale Mount Everest, the world's tallest mountain. 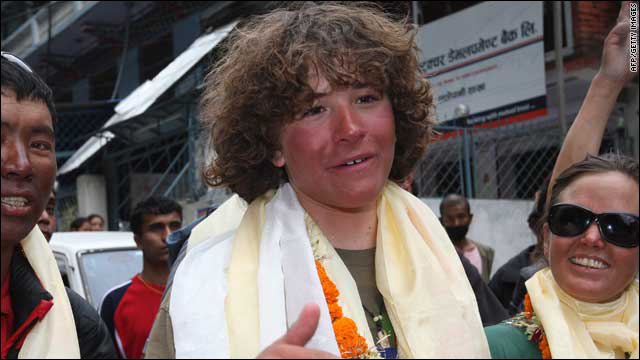 On May 22, 2010, Jordan Romero, age 13, became the youngest person in the world to reach the summit of Mount Everest, setting a new World Record. Jordan’s entire ascent up Mount Everest was monitored by a GPS tracker, and relayed to his family back home in California. Because of Jordan’s young age, the Nepalese government would not give him permission to climb Mount Everest from Nepal. Instead, Jordan had to make his ascent up the mountain from a much more difficult and treacherous approach, which is the Chinese side, where there is no age restriction. 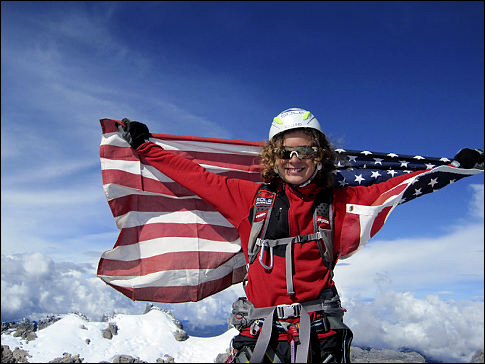 Jordan Romero has now successfully climbed the tallest mountains on six of the world's seven continents. He climbed the Mount Kilimanjaro summit in Tanzania at the age of 10, setting a world record. Jordan’s quest includes climbing all of the highest peaks of the tallest mountains on every continent. He has accomplished every one of those goals except one, and plans on tackling the last summit of his quest in December 2010, when Jordan will attempt to climb Mt. Vinson, Antarctica’s highest peak at 16,050 feet. Dr. Ann de Wees Allen, Chief of Biomedical Research at the Glycemic Research Institute (www.Glycemic.com), has been working on Human Sports Performance with Jordan’s father, Paul Romero for the past 7 years, and Jordan has been on the Human Sports Performance Kids NanoCroc Committee since he was age 9 (www.HumanSportsPerformance.com). Dr. Ann de Wees Allen was one of Jordan’s Primary Sponsors for the Mount Everest climb, and designed a Nitric Oxide drink for Jordan to take with him up the mountain. Jordan, along with his father, visited Dr. Allen at her home in Florida right before he left for Mount Everest, and they discussed Jordan’s plans to educate and inspire kids, and to help fight the childhood obesity epidemic. from the top of the world,"
The youngest person to climb the world's highest mountain has said age is no bar to following one's dreams and that he would encourage children even younger than himself to scale Everest. He said he wanted to give the message that if one sets out to do anything, it is possible. He got the idea to climb the seven summits in 2004, when he saw a mural on the wall of his school. He climbed his first of the seven summits, Mount Kilimanjaro in Africa, aged 10, in 2006. The Romeros spent about 15 minutes at the summit, during which Jordan called his mother in the U.S. on a satellite phone. "I said, 'Mom, this is your son calling from the top of the world," an assured-looking Jordan told the news conference.